My Spiral Tapestry was woven as a tapestry, thirteen yards long and four inches wide with 182 darts of negative space. Once completed the negative space was removed by pulling the warp and closing the spaces. Technically, the shape is a helicoid; a remarkable form which packs great densities into small spaces. 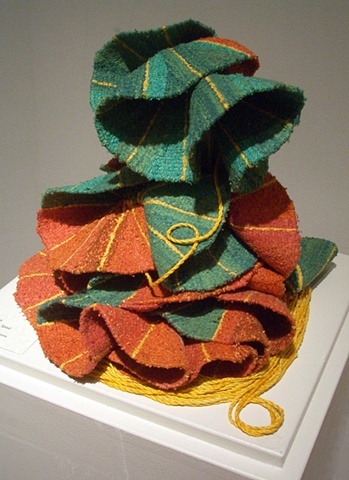 For shipping, My Spiral Tapestry flattens to a cylinder shape less than nine inches wide and only three inches high. Once opened however, the many yards of tapestry take on an organic and lively appearance as they fall from a helicoidal spiral into a droopy yet energetic shape uniquely its own.